ST. GEORGE — The Bureau of Land Management Arizona Strip Field Office is managing two lightning-caused fires within 30 miles of St. George. Both fires have grown in size since they were first reported. Both fires were first observed from the same point, Black Rock Lookout. 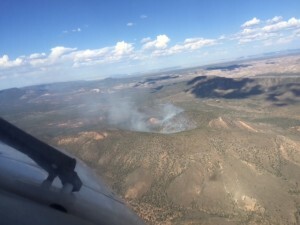 The Sand Cove Fire is located 30 miles southwest of St. George within the Paiute Wilderness of the Grand Canyon-Parashant National Monument, and the Wolf Hole Fire is approximately 10 miles south of St. George on the Arizona Strip near Hodgets Canyon. The Sand Cove Fire was caused by lightning, and was first observed from the lookout Monday at 4 p.m. The fire is has grown from 20 acres when first reported to approximately 55 acres as of Wednesday morning. Resources on the fire now include two fire engines and crews. “The fire is being managed to sustain the health and viability of the landscape to achieve the goals approved in the Grand Canyon-Parashant National Monument Resource Management Plan,” Mark Rosenthal, BLM Arizona Strip fire management officer, said. The fire is expected to be active Wednesday, according to a press statement. Also lightning caused, the Wolf Hole Fire was first observed from the Black Rock Lookout Tuesday. The fire has grown from 5 acres when first reported to approximately 25 acres as of Wednesday morning. The fire and is smoldering and creeping, and is expected to be active Wednesday. Resources on the fire include one hot shot crew, one type 3 helicopter and one type 4 engine. Four single-engine air tankers were ordered Tuesday. Because of the difficulty of the terrain and continuous nature of the fuels, the fire will rely heavily on air tankers. The fire is being managed for full suppression. “Due to high winds and fire activity, including torching and spotting, the fire is being suppressed due to its location and concerns for potential impacts on the Mohave Desert,” Rosenthal said Tuesday. In the cases of both fires, there are no road or trail closures anticipated. The public is urged to use caution when traveling in the area. 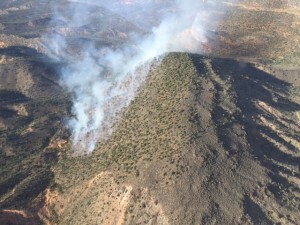 Smoke may be visible from St. George. Use caution with campfires as we enter a period of hot, dry weather.